We all love summers. A summer season is incomplete without family reunions, picnics, and get-together. Likewise, home improvement projects are an integral part of summers. In fact, keeping your tenants comfortable during summers can be quite challenging in terms of energy efficiency. With the efficient system and proper settings in place, not only you can save energy but also helps your tenants beat the summer heat. 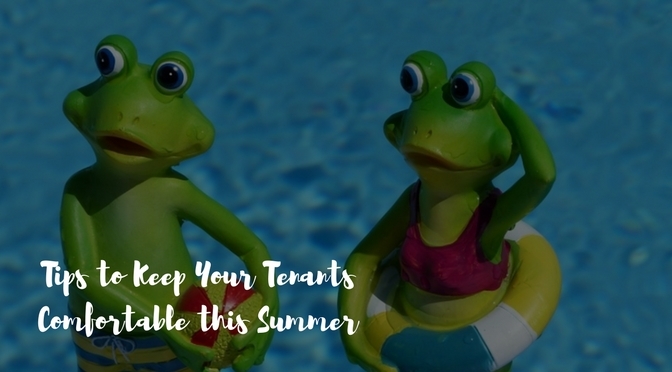 Keeping tenants happy, this summer is important to increase the longevity of your investment. Here are some tips to keep your tenants comfortable this summer. Give tenants the freedom to control: For instance, if you have a centralized heater for your property and if it turns too hot inside the home, it is obvious that tenants will open windows which further leads to energy inefficiency. Therefore, it is always better to give away freedom for tenants to control the temperature, as and when necessary. Keep your tenants engaged: Help your tenants save on energy and stay cool by engaging them to plant their own shade plants to stop the excess summer heat from getting inside. Involving tenants in energy efficiency sends out a positive message and invite collaboration about temperature issues. Non-mechanical cooling options: Placing shade trees, building greenery and planter boxes can help you block the sun and helps in creating cool breeze effect near your property. Though these cannot help you in fix the summer problems immediately, they certainly help in long run. They also contribute greatly to improving tenant comfort and drastically reduce energy usage. Keep drain channels clean: This is another area for maintenance and should be kept clear. This can drain moisture and reduce the humidity. Though some tenants volunteer to do the basics like vacuuming the filters, maintenance work and more intricate services – checking airflow, thermostats refrigerants, and leaks – should really be left to the professionals. As a landlord, ensure to arrange an annual service of air conditioning in your rental properties to keep the units in good working condition. Keep it cool: Just as you enjoy staying cool in summer, keeping your rental property cool is also very important. Therefore, make sure that swamp coolers are functioning at their best by ensuring to have a professional service conducted over them. Besides, ensure that all screws on ceiling fans are tight to reduce the risk of imbalanced blades. Save energy and help your tenants save money every month on reduced power bills by following these tips. Keeping things cool by performing summer maintenance will help you in getting rebates for upgrades as well. Hire PORTIQO to take the hassle out of summer maintenance. To learn more about ROI on your rental property, stay logged in to PORTIQO. At PORTIQO, we will be happy to provide all the information that you are looking forward to reading.